I love learning what works for moms! In using twitter, I met the most organized entrepreneur mom ever, Melissa Lierman, @timeoutmom. She shared with me the most important technology tools she uses to keep her busy home organized. My blackberry allows me to go to more kids activities because I can take the office with me. Online bill paying takes the stress out of finances. Have a dimmer switch in your bathroom for bath time relaxation. Have a DVR so you are not tied to regular television viewing. We just record our shows and watch when we want. We have 2 DVRs, one for the family and one for me! We have a slew of timers. We play beat the clock, set the timer for 15 minutes and do crazy fast RTO = Restore the Order to the house. The computer makes great spreadsheets for chore charts, after school routines, and organize weekly & monthly projects. My favorite non-tech item is her end-all be-all giant family calendar – master calendar to organize everyone’s work and activities. Thanks Melissa for these great ideas! Melissa Lierman will be married to her wonderful husband John 14 years in November and is a busy mom of 3 great kids – smart and sharp 11 year old MacKenzie Peter, artistic and creative almost 9 year old Maria Stella, and powerhouse action-packed 2.5 year old Jonathan Roger. She believes that the keys to success for a busy household are: lots of love, lots of patience, and lots of organization, and great communication. Melissa runs 3 businesses as a work at home mom. She travels once a a month speaking all across the United States and Canada teaching and training how to use Social Media and Twitter for Business. She fills in her time between travel with her product business (all mom-made), her training and consulting business, and her work with authors. She teaches how to do it smarter, better, faster, stronger and goes by the nickname The Bionic Wonder Woman ! Getting organized for a move makes all the difference. It is so overwhelming to move that breaking it into baby steps keeps you sane! As soon as you know you are moving, start decluttering! There are so many items you will not want that getting them out and away right away saves you time and money in packing and moving. Pack only what you love and use. Leave behind the items that you know you will not use or need at the new home. Establish a notebook for all the details. Use a binder with slash pockets for receipts and other small slips or papers. Use it to track phone calls, hold samples of flooring and wallpaper, paint swatches and drapery goods, hold receipts, schedule appointments to turn on your lights, water, cable and other essentials. Keep it with you at all times! Give each packer a sheet of labels. Place a label on all 4 corners of every box as it is packed. Pack the essentials first. Pack a box containing the essentials of life: coffeemaker and children’s night time loveys, bed sheets and blankets and pillows, an alarm clock, toilet paper, shampoos and toiletries and more. Your Essentials Box should contain all those items you’ll need for the first day and night in your new home. With small children, think about including dishes, cereal and all the little stuff you need daily. Enlist all the help you can get. Get friends or family to watch your children as you pack and unpack too! Say “yes” to any and all offers of food, extra hands, and other assistance. Get plenty of wrapping paper and heavy-duty tape. Use unprinted newsprint. For items you prefer to keep clean, you can purchase this packing paper from your mover. Kraft paper, tissue paper and shock-resistant corrugated paper make excellent wrapping materials and may be purchased at most major department stores, craft stores or your mover. Pack on a room-by-room basis. Start with the least used room. Keep the contents of each room in separate boxes. Before you begin unpacking randomly, sit down with your family. Discuss a plan, including where things will go, who is responsible for what, etc. It will help things run smoothly. Keep a tool kit handy to reassemble the items. Arrange your furniture, and then unpack accessories and personal items. Give yourself extra time. Getting items into boxes and moving takes more time than you think. And of course something can go wrong too, so just add a few extra hours to each piece of the moving job. Over the last few years, I have realized that we all struggle with finishing things up! In learning more about this, I read the book Following Through by Steve Levinson and Pete Greider. Some really simple concepts emerged from this short read. The book covers both new perspectives on why we fail to follow through and strategies for us to do so. Two ideas were most valuable in following through on tasks. Personally and professionally, I tapped into both of these concepts. Compelling reasons are a critical aspect of follow through. Make the reason for completioncritical to you and eliminate wiggle room for not completing a task. Compelling reasons include highly motivating accountability. Host an early meeting in your office so you must get your desk in order to start the day. Plan an anniversary party to clear the clutter in your family room. Pay an incentive to an assistant to get your work bid out on time. Each person has different ways and thoughts on what is truly compelling, from financial gain or loss to personal consequences. Tapping into your personal ideas is what makes the big difference. Strike while the iron is hot makes use of our natural high energy to finish a task. While you are sensing urgency to complete a task do so. Use your intention to complete to help you finish up. Levinson and Greider use the example of while you are grateful, write your thank you note right away. They state “use your intention while your emotions are stirred.” Acknowledging that inspiration can fade, use it to full advantage while you feel it. Clear your clutter when you are most agitated and frustrated by it. Look at your credit card bill and pay it right away. When you hear a productivity tip you like, use it that day. Take the action while highly motivated. If you are struggling with completing tasks, this is the book for you! Organizing takes a new level when company is coming! Flylady often talks about CHAOS – can’t have anyone over syndrome. But with a few tricks, organizing can make a difference for you and your guests. Company’s coming and it’s time to get organized! Set a real date for real company and you will be propelled into action. Brain chemistry kicks in and you are focused, energized, and making decisions. Clients who are determined to invite people over really make change happen! It can be an anniversary party or a surprise bday party; whenever it is something very special it makes a difference. Break your responsibilities into baby steps. Set a time table that works for you. Set the date and work backwards, allowing more time than you think to get things done. Create the guest list and make invitations 4 weeks in advance. Invite guests 2 weeks in advance. Make a list of what you are serving and your groceries to purchase a week in advance. Start your food preparation 3 days in advance. Clean the house 2 days ahead of the party. Set the table the day before and purchase flowers that day. The day of the party turn on lights and music, set the food out, and enjoy yourself! Cultivate team members to help you. Look at the strengths of your team members, including your kids, to see who can do what. I recently worked with a family where one daughter was great at cleaning, one was great at decorating and one was great at clean up. They each enjoyed their part of the party planning. Sometimes a little healthy competition works too. A husband and wife were working together on painting and putting up storage in a room. As they worked, each judged how far along they were, and both finished about the same time. Partnering creates success! When it comes to food, choose what you do best and delegate other responsibilities. With oodles of catering, choose the snacks to make and the snacks to purchase. Or have a signature dish you make all the time as your “go to” recipe. Ina Garten and Sandra Lee, both from Food Network, talk about simple dinner fare. Take a tip from these accomplished ladies. Make people the focus, not perfection. Often clients scurry about worrying about whether the windows are clean enough, the food divinely delish, or the music special. It is all about your time with your guests more than anything else. Take the time to really be in the moment of the party. Just before the party begins, take a moment to survey your success. It is that time in which you know how much you have accomplished. Simplify your holiday with these ideas! 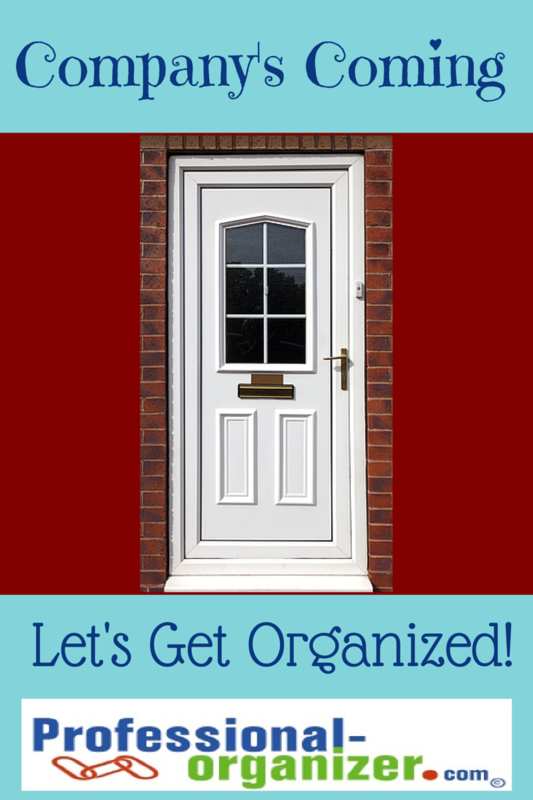 Join me on Facebook for daily organizing inspiration! 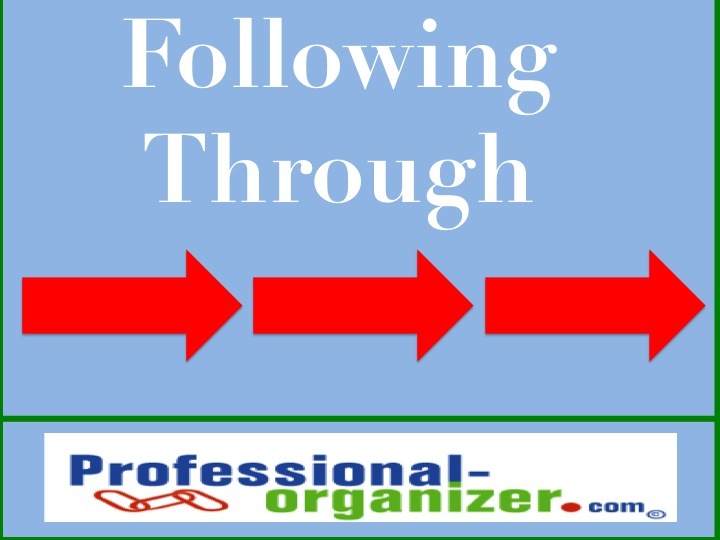 https://professional-organizer.com/WordPress/wp-content/uploads/2016/07/logo.png 0 0 Ellen https://professional-organizer.com/WordPress/wp-content/uploads/2016/07/logo.png Ellen2010-07-05 17:59:072014-09-10 21:09:47Company's coming! Get Organized!